While my favorite topic is dividend investing, I also like to share ideas/experiences/products that help me save money so I can use that saved money on investing in more dividend growth stocks. 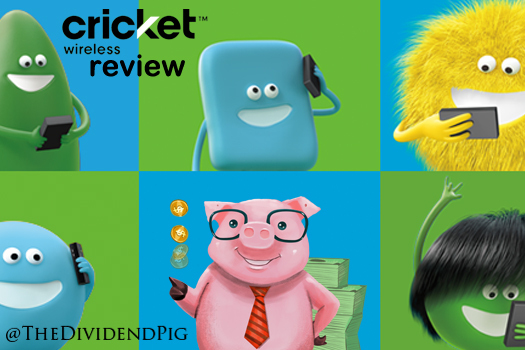 My Cricket Wireless review is just that, a product that can save you a ton of money and allow you to put that saved money to work. For the last two years I have been a captive customer of Verizon. I never had a single problem with the service and always had excellent coverage and download speeds. I like Verizon’s product. However, I did not like that I was paying a serious premium for that excellent service, somewhere in the vicinity of 50%. Once you start shopping your mobile carrier service, you quickly learn there are lots of options and most of them don’t seem worth the effort of switching… but some of them are! I am somewhat of a mobile service provider junkie, always looking for the best deal. I’ve been with Sprint, T-Mobile, AT&T (Cingular) and Verizon in the past so I have plenty of experience from which to draw. For the last 2 years, I’ve been paying $147 a month (or $1,764 a year) to Verizon for our mobile phone service. Wow, that’s a lot of money! The package included 2 lines, unlimited talk and text and 6GB of LTE data per line. In that deal, I purchased two phones at contract prices, I think they were both roughly $250 each. You aren’t going to find a cheaper, full service mobile phone alternative than Cricket Wireless. Listed prices are “all in” fees. No additional taxes, what you see is what you get pricing. If your bill is a $35/month plan, then that’s all you pay! Now, the real deals come once you add your family or friends to your plan. You can add up to 5 people on one plan (AKA 1 bill) and get some huge savings. For every person you add, you get 10 bucks off your bill. Here is how the math works out. Boom, $20 bucks a month for a full featured phone service, unlimited calling, unlimited text and a throttled 2.5GBs a month. Oh, if you do go this route, make sure you only put people on your account you trust. You are going to be responsible for the bill wether the people on your plan pay you or not! Visual voicemail – I didn’t have that feature with Verizon as it cost an extra 5 bucks a month. In March of 2014 AT&T finally announced the completion of its acquisition of Cricket Wireless. This purchase gave AT&T a discount service it could use to compete with the cheaper priced 4G LTE carriers like MetroPCS, Sprint & T-Mobile without having to destroy its higher margin AT&T branded service. The move to Cricket was pretty simple. I have a store a few miles from my home and went in to take a look around. Apparently, all of the stores are independently owned franchisees so your store might be a little different experience. Mine was an updated MetroPCS store that had moved over to Cricket. Anyway, I went in a spoke with the folks behind the desk who gave me the lowdown on the service and did the switch for me. I have looked at Republic Wireless, Google FI and found Cricket Wireless is better for me. For one, I haven’t had pleasant experiences with T-Mobile (this was several years ago & I hear they have done a great job updating their service since then) & Sprint, the network Republic Wireless resells (when not WiFi). Google FI, cheapest phone service is $30 a month, which is $10 a month (or $120 a year) too much! Here’s the rub, Cricket Wireless data speeds are capped to 8 Mpbs down. Now, nobody likes to hear they aren’t getting the fastest of the fast. However, 8Mpbs down is still really fast and more than capable of handling anything you want to do on your phone. To demonstrate the capability of 8Mpbs down, Cricket Wireless throttled download speeds, Netflix streams a 1080p HD movie at 5Mbps. So Cricket Wireless is capable of streaming a Netflix 1080p HD movie to your phone. Check. On the flip side, you don’t actually want to stream a Netflix movie on your phone as you would quickly burn through your included 2.5GB, 3GB, 4GB data transfer limit. It’s hard to quantify the coverage and signal strength in my Cricket Wireless review. I live in a bigger city, Atlanta, where we get awesome AT&T coverage. In fact, I can’t drive to work without being told by a gigantic billboard how great the AT&T coverage is in my area. I guess that’s good for me, however, your results may vary. Over the last year I’ve used Cricket and I’ve had a great experience. I’ve traveled to many remote areas and have had only minor interruptions in service. On occasion, my phone will go from LTE to 4G to G but it’s never prevented me from making a phone call when necessary. I think it’s easy for people to get wrapped up in having the best coverage, the fastest download speeds especially with the constant barrage of “the best coverage” marketing. Frankly, do you really need all that stuff? Maybe you do, but I certainly don’t. I’m not ashamed to admit it, I’m frugal and proud. Cricket Wireless has given me a great service for a reasonable price. I am now paying $40 a month ($20 a month x 2 lines thanks to the other family members on my plan) or $480 a year! In terms of service, there has only been one issue worth mentioning. A few months ago, Cricket did have an outage on a Friday night. I don’t remember exactly, but I think from roughly 7pm Friday night to early Saturday morning the network was down which turned everyone’s Cricket phones into expensive flashlights. No calls, no texts, no data & no Google map directions… that wasn’t fun. Full disclosure: I did not receive any compensation to write this review, however I do own AT&T stock in my dividend portfolio. But, even if all of the 100 people that read this review went out and switched to Cricket, it wouldn’t move the needle at all so, I don’t think I have much of a vested interest. Great move. I did something similar a few years ago. After the smartphone novelty wore off I noticed most of my time was spent on phone and text and the least was data. I got rid of my smartphone and switched to a feature phone and AT$T pay as you go plan This plan only costs me $100 a year. For data I mostly use my tablet so I bought a Karma wireless hotspot that costs me $120 year so total is $220 or $18 a month ($22 /month savings). Thanks! That’s some really nice savings you got there. You’re bolder than I am, loosing the smartphone completely is serious! Well done. Thank you for sharing, I’ll checkout that hotspot!